As I sit here updating this “About” page as a mother of two who still loves to drink beer, workout, and travel (not necessarily in that order), it’s amazing to me to realize how quickly time changes things…and how many things stay the same. In the spring of 2004, I was living in France, traveling around Europe, and loving the freedom of being single and 22. I had broken up with my long-term boyfriend right when everyone else I knew from MN was getting married and having kids. No way, no how, was I in any way ready for that life. In December of 2004 I came out to Colorado on vacation to see an old college friend, and by April the future hubby and I were dating so I stuck around the area. As each season changed, I started to think more and more that holy crap he could be the one (! ), and so I kept on living in this little mountain town. 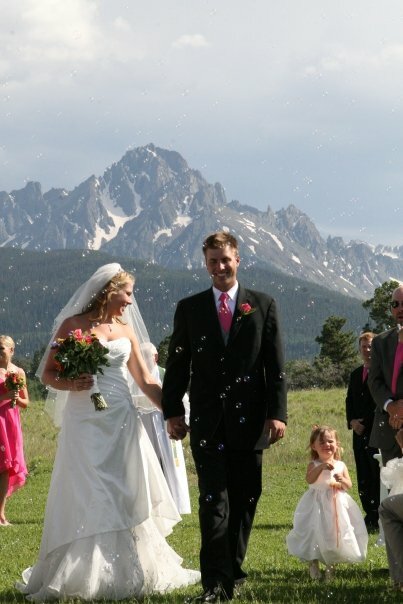 In November of 2007, Charlie proposed, and in July of 2008 we were married in a beautiful ceremony on the mountainside. There are days when I can’t believe I live here. It’s beautiful, but it’s tiny; it’s breathtaking, but it’s rural. It’s exactly where I’d love to raise a child, but not at all where I ever saw myself living & working (I was an International Business major in college). It’s funny how life works out, isn’t it? Long story short, we got married, we bought a house, we did all those little “American Dream” stepping stones…but along the way, we figured out that it was going to be harder than we’d ever imagined to start our family. Thanks to the Infertility blogging world, I now know that many couples have been through more than us on this journey to parenthood, and many have been through less…but either way, I wouldn’t wish a single minute of this frustrating journey on anyone. After 21 months of TTC, Charlie and I were blessed to finally get our elusive BFP after a clomid + menopur protocol IUI cycle, and on December 8th, 2011 (at exactly 38 weeks), we welcomed our daughter Stella Joan into this world. On May 1, 2013, we found out that we were expecting again — this time without the help of doctors and meds — just plain old fashioned charting and temping and a quickie while the toddler was watching Super Why. Could this be for real? The second time around, we decided to pursue a home birth experience, and on January 12, 2014 (at 40 weeks 4 days), our son Harvey was born into the water of a temporary pool we had set up in our guest room in the most fantastic birth experience I could have hoped for. Our family was complete. I just stumbled on your blog, there are some crazy similarities with my own life! I was just shy of 22 (a little later than you, 2008) and after studying in Germany and Hungary for most of university (central and western European studies major), I’d landed a job in London. I’d recently also broken up with my serious boyfriend, and I was very busy loving life, was having so much fun traveling and being fancy free and just me. Then the economy took a nose dive, I lost my exciting international media job (complete with record release parties and regular press conferences at parliament), and back to my parents in Wisconsin I went for what I thought was going to be a very boring Christmas. Just 2 weeks later, however, I met my own Charlie, and 18 months later we were married! Funny how life works out… 5 years later I definitely don’t have the life I imagined for myself while daydreaming on the Tube, but I wouldn’t have it any other way! Congratulations on your beautiful family, I wish I’d had the courage to write openly online about our struggles to start a family, and I thank you so much for sharing your story! I used to read your blog back in the day when I was trying to get pregnant with my daughter. I stopped blogging so much for a while and lost track of you. Now I am in the thick of trying for number 2 and have been blogging a lot more. Today I saw your like Jen’s post on plan B and I was like, hey, I remember Josie! Anyway, I’m happy to have found your blog again. You photos are wonderful, especially that last one! Thanks! I just saw this after I commented on YOUR about page. LOL. Glad to have you back!